In a food processor, combine the cream cheese, avocado, vanilla and lemon juice. Blend until creamy, add the powdered sugar and mix until well blended. Transfer to a zip-lock bag and chill for 30 minutes. Dice your fruit, transfer to a plate and set aside. In a 4-quart pot, preheat 3 cups of canola oil at medium heat for 10 to 12 minutes or until it reaches a temperature of 350°F. In a shallow dish, combine the granulated sugar and cinnamon. Set aside. Wrap the flour tortillas in paper towels and heat in the microwave for 45 seconds to 1 minute. Remove the avocado cream from the refrigerator and cut the tip of one corner to make a piping bag. Keep the bag upright in a tall glass until ready to use. Take a warmed flour tortilla, fill the center with three strawberry slices and avocado cream, and top with a few pieces of diced mango. Gently fold and roll up like a burrito. Use a toothpick at the seam to secure. Continue filling and rolling until all done. Using metal tongs, fry two chimichangas at a time, turning when golden brown. If they brown too fast, reduce the temperature of the oil slightly. As you remove the chimichangas from the oil, transfer them to the cinnamon/sugar mixture and gently roll to coat evenly. Transfer to a baking sheet lined with parchment paper. Repeat until all are done. In a bowl, combine the chocolate chips and vegetable shortening. Microwave on high for 1 minute and stir well. Cook for another 10 seconds, stirring until creamy. Dip a fork into the chocolate and drizzle over the chimichangas, moving quickly from side to side. Best served right away, or let the chocolate set for 30 minutes. Serve with kiwi and other fresh fruit. Fried foods are best served right away. If you find yourself with leftovers, the best way to reheat them is in a nonstick skillet at medium heat. Heat until crispy. The first time I tried a chimichanga, or fried burrito, was when I lived in Texas. The wonderful thing about this food is that it can be made with sweet or savory fillings. The sweet version rolled in cinnamon and sugar is very much like the buñuelos I grew up eating as a child. 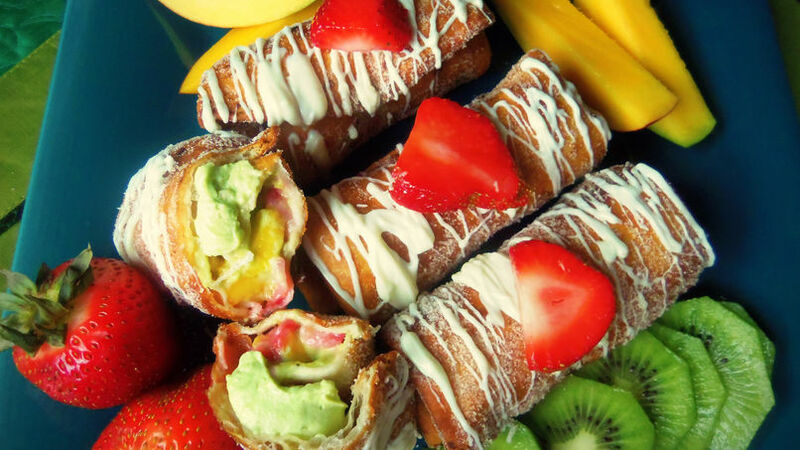 For this recipe, I figured I could get creative and make a sweet chimichanga with fruit and avocado. Finger-licking good!